* Price Per Unit may reflect product's price per capsule, tablet, ounce, fluid ounce, etc. Only 3 In Stock - ORDER NOW. This item will ship tomorrow. ▲ ▼ Autoship every days. Never run out. Get Double rewards with AUTOSHIP. I love the smell of Bay Essential Oil by Aura Cacia. I cannot wait to use it as a pre shave oil and after shave. I use Bay Essential Oil by Aura Cacia to add to my beard oils and it works great. I mix it to create a bay rum scent. 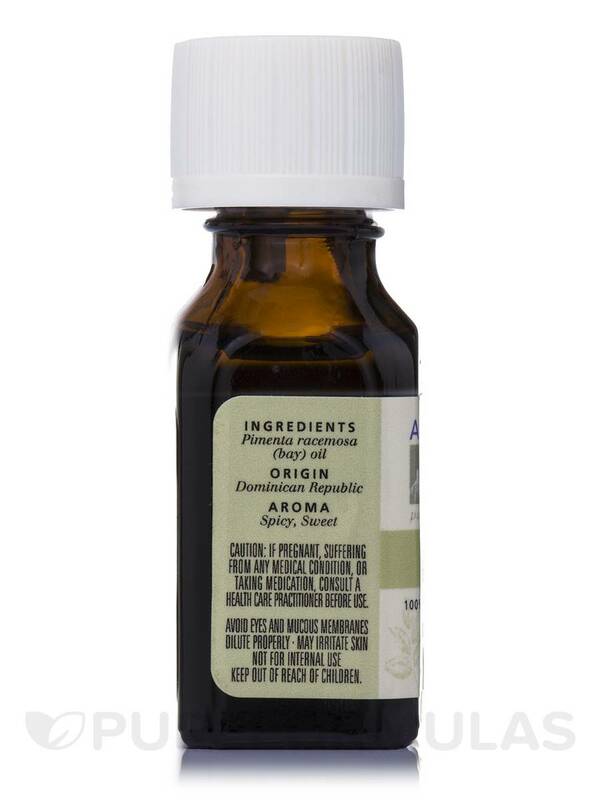 Bay Essential Oil (Pimenta racemosa) 0.5 fl. oz. 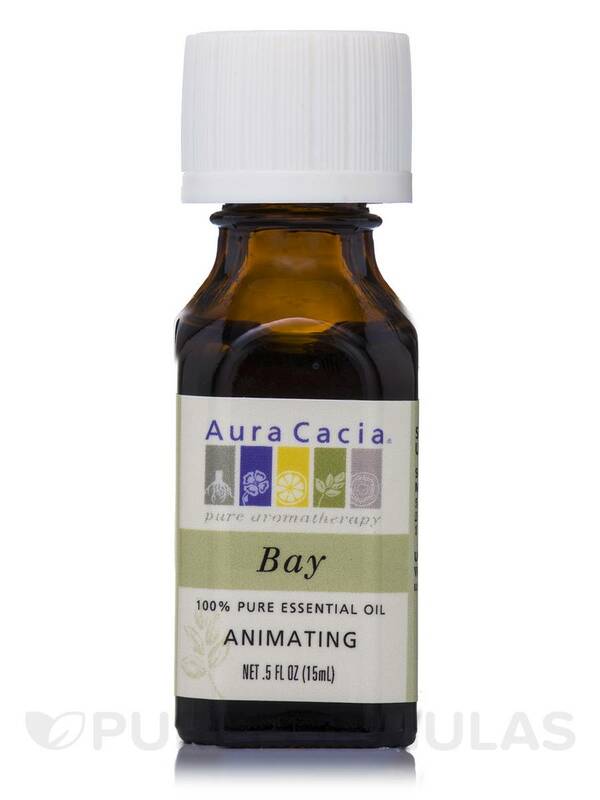 Bay Essential Oil by Aura Cacia may possibly help invigorate your senses. It might also promote perspiration—which potentially can removed body toxins‚ excess salt‚ and water. Bay essential oil (Pimenta racemosa) is believed to have antiseptic properties‚ which inhibit bacterial growth while preventing pain. It may possibly help induce the contraction of blood vessels. 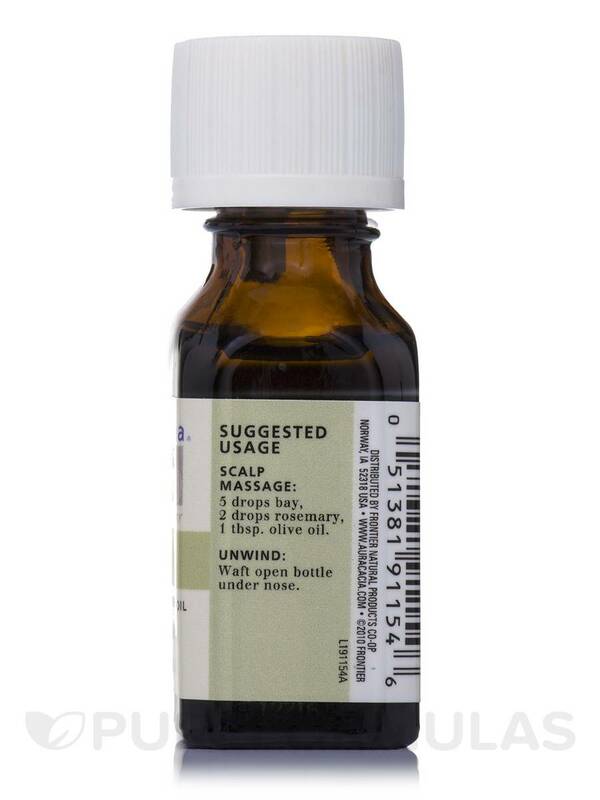 Bay oil might also be able to help relieve spasms by relaxing the muscles. Diluting bay essential oil in jojoba oil can make a scalp tonic‚ which is believed to help prevent dandruff. 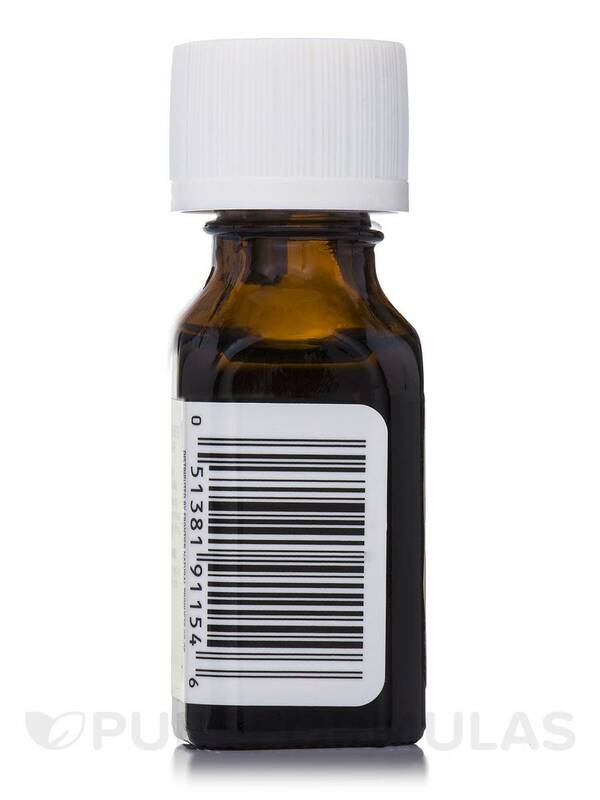 This oil may also possibly help ease certain cold symptoms when combined with eucalyptus oil. Pimenta racemosa (Bay) Oil: Is believed to have antiseptic properties and may possibly be able to help relieve muscular pain and cold symptoms. These statements have not been evaluated by the Food and Drug Administration (FDA). These products are not meant to diagnose‚ treat or cure any disease or medical condition. Please consult your doctor before starting any exercise or nutritional supplement program or before using these or any product during pregnancy or if you have a serious medical condition. If pregnant‚ suffering from any medical condition‚ or taking medication‚ consult a health care practitioner before use. Avoid eyes and mucous membranes. Dilute properly. May irritate skin. Not for internal use. Keep out of reach of children. I use Bay Essential Oil by Aura Cacia as an essential oil for a hair mixture that I make. I would recommend this item to a friend. A very true-to-life Bay scent! Bay Essential Oil by Aura Cacia is pretty strong overall, a bit on the organic-material smelling side for me, but no mistaking - it is in fact Bay. Good for mixing to create some more musky/manly yet fresh beard/hair oils for men. Not sure if it's a smell the ladies would want to wear or not. It's not fake, almost too real in that I could darn near smell the roots of the plant (in my mind at least). Price was reasonable, grab it on sale if you can. A little plant-y smelling, but not a deal breaker by any means. I've brought other brands of Bay and this Bay Essential Oil by Aura Cacia smells nothing like it! Very disappointed. The smell!! It's not even close to the other brands of Bay that I've bought. Got Bay Essential Oil by Aura Cacia to use in some diy essential oil blends, great quality for a great price. Love how aura cacias dripper tips work! As you may know Bay Essential Oil by Aura Cacia is one of the best products for hair. It make them shine and improves the growth by ameliorating blood circulation. Yes, it has got a very strong aroma, some people complain about head ache, also you've got to be careful and try it on your hand firstly: maybe you will get allergy reaction. I make oil pre washing hair mask: any of neutral oil coconut, avocado, sesame, macadamia, shea whatever you have and some drops of bay oil. I add 1 drop for 1 tb sp of neutral oil. After, you've got to warm this blend some more, take the vessel and put it in a boiling water. Now you should apply it on your hair and scalp. Use polyethylene film to keep your hair in warmness (I use blanket on film too). Relax for at least 1 hour (I got 3 or more), then take the blanket away and warm your hair under polyethylene film with hair dryer 5-10 minutes should be enough and then wash this mask away. As a result my hair become so smooth and shiny I've never seen before. Also as a benefit I reduced my hair loss. Please ask any questions you may have about this specific product in the field below. Your question(s) and our corresponding answer(s) will not be confidential and will be posted publically on this specific product page. Additionally, PureFormulas is unable to directly recommend products in relation to specific health conditions. Please contact your trusted healthcare practitioner for direct product recommendations. If you are pregnant, nursing, taking any medications or have any medical condition, consult your doctor before use. Your healthcare professional is the best source for guidance before beginning an exercise or nutritional supplement program. SUBSCRIBE TO RECEIVE EXCLUSIVE OFFERS! We at PureFormulas value your privacy. We will never sell, rent, or share your information.